You must have previously visited the site at least once and have it’s information still in your browser’s cache. The site must have Google Custom search enabled. You must be using Google Chrome. Now that we got that covered, the rest is simple. In the Google Chrome omnibar, Type in the address of the site that you would like to search. Immediately after the address either Press Tab or the Space bar on your computer. The URL address should switch over to a light blue box with “Search” in front of it. Now go ahead and enter type in your query. Now Chrome should direct you straight to the websites Google Custom search page with the results from your query listed. 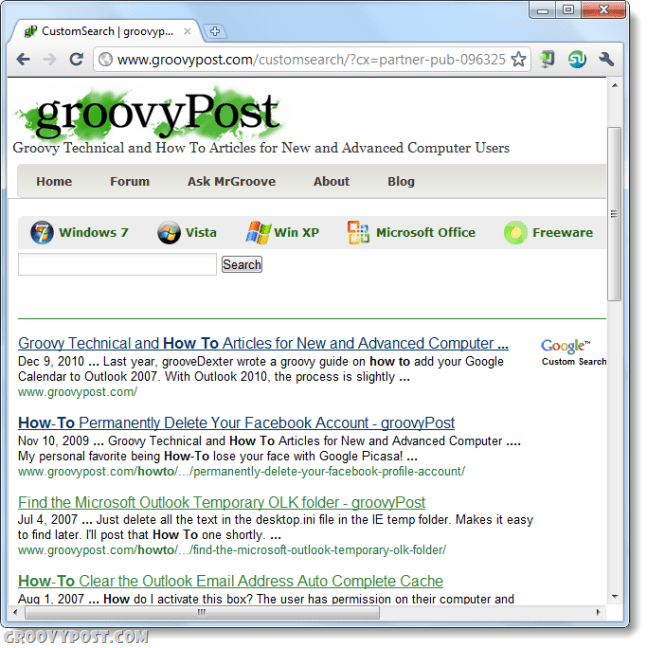 In the screenshot below you can see what it looks like when searching groovyPost. Keep in mind that this doesn’t work for every website, but on the ones that it does you now have an extra groovy trick up your sleeve. Nice chrome tip. So far it’s working on about half the blogs I read. I’m guessing that cause some done have google site search enabled on their site yes? You would think this would work since they are indexed with google anyway. oh well… nice tip. It probably has something to do with the API actually so yeah, if you try a site and TAB does not work, it’s because they don’t have Google Site Search enabled.